Beautiful 3 bedroom and 2.5 bathroom townhome in the amazing Vacation Resort "EMERALD ISLAND"
Fully equipped for family living! For the kids - unit has a pack 'n play, stroller and baby bath. 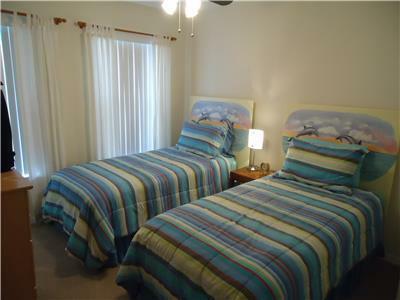 Pretty Townhouse with 3 bedrooms, 2.5 bathrooms in the popular Emerald Island Resort. The 3 bed rooms are as follows: 1 MASTER QUEEN bed room with TV, ceiling fans and balcony - private ensuite bath featuring large shower, 1 QUEEN bed room, TV, ceiling fan and 1 TWIN (2 single) bed room, TV, ceiling fan - these two rooms share a bath room with a shower/tub combo. At the EMERALD ISLAND RESORT you can keep busy playing tennis on the lighted tennis courts or just take a nature walk. Relax at the Tiki Bar by the clubhouse pool. For the little folks there are two playgrounds. Of course you can just relax in the townhouse or at the clubhouse lounge. Only 5 mins from Disney, 20 mins from Sea World and 25 mins from Universal, 10 minutes from the Orlando Prime Outlet Mall. 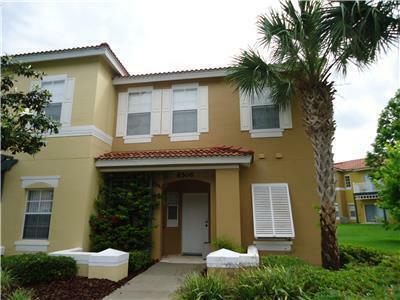 Further Details: This location allows you to take advantage of all that the Orlando area has to offer. If it's GOLF your looking for there are many courses close by. Recommended Golf courses in the area are King's Ridge, Highlands Reserve, The Legends and The Plantation.The local restaurants range from 'Kid Friendly' to adult dining. Need a day off from all of the excitement? Approximately one hour away is the Beach (East coast or West coast). Only one hour on RT4 and you could be at the Hard Rock Casino (Las Vegas style gambling). Make your vacation memorable, visit, enjoy, but most of all be comfortable!